This history has been compiled from the Navy's official ship's histories for the USS Oklahoma City plus a few other reliable sources. If you want a more detailed day-to-day history, or if you want to read the official histories, visit the Official Ship's History page. The USS Oklahoma City was the 20th of 27 Cleveland class light cruisers constructed during World War II. Construction of CL-91 started on December 8, 1942, a year and a day after Pearl Harbor. The ship was built at the Cramp Shipbuilding Company in Philadelphia, Pennsylvania, and was launched on 20 February, 1944. The ship's sponsor was Mrs. Anton H. Classen. Construction continued through 1944 and the ship was commissioned on 22 December, 1944, two years and 14 days after construction started. After commissioning the ship conducted a series of shakedown and training cruises off the east coast and at Trinidad, British West Indies. This was followed by a yard period at the Navy Yard, Philadelphia. The ship then left for training at Guantanamo, Cuba, in company with the USS Topeka (CL-67). The ships then left the Atlantic Ocean, passing through the Panama Canal into the Pacific. The ships arrived at Pearl Harbor on 2 May, 1945, and reported to the Commander of Cruisers in the Pacific (ComCruPac) for duty. After additional training operations in Hawaiian waters the ships departed for Ulithi Atoll on 22 May, 1945, arriving 1 June. Oklahoma City joined Carrier Task Group 38.1 on 6 June, 1945, and proceeded to operations supporting the invasion of Okinawa, providing long range radar warning and anti-aircraft cover for the fleet. The ship steamed to San Pedro Bay, Leyte Island, Philippines, arriving 23 June. On 1 July Oklahoma City proceeded with Task Group 38.1 en route to the Japanese home islands. On 18 July 1945 the Oklahoma City joined with USS Topeka (CL-67), USS Atlanta (CL-104) and USS Dayton (CL-105) in Task Group 35.4 to bombard radar installations at Nojima Saki (Nojimazaki) near the entrance to Tokyo Bay, Japan. This was the only actual combat engagement for the OK City in WWII. 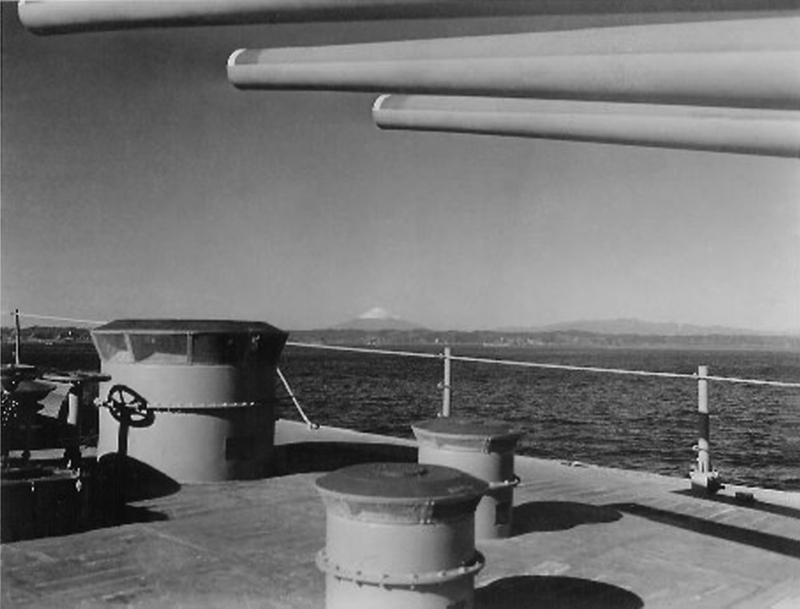 The ship fired 60 rounds of 6"/47 HC projectiles. After these operations the Okie Boat rejoined carrier Task Group 38.1. 15 August, 1945, the ship received an AllNav notice from the Secretary of the Navy that Japan had accepted the terms of the Potsdam Agreement, with orders to cease operations. The ship continued to patrol off the coast of Japan with Task Group 38.2 after hostilities ended, and entered Tokyo Bay on 10 September, 1945, after 72 days at sea. * On 15 September the task group sortied to patrol near Japan, and on 20 September Task Group 38.2 was assigned to the Fifth Fleet and became TG 58.2. On 21 September Oklahoma City joined with USS Flint (CL-97) in Task Unit 58.2.12 and steamed to Eniwetok, Western Marshall Islands. The ship returned to Tokyo Bay 13 October and resumed operations in the Japanese Islands, arriving in Sasebo on 1 December, 1945. The ship departed Sasebo 30 January, 1946, en route to the United States. The Oklahoma City arrived at San Francisco 14 February, 1946, and then went into Mare Island Naval Shipyard on 15 August for deactivation. The ship was decommissioned 30 June, 1947, and placed in the San Francisco Group of the U.S. Pacific Reserve Fleet. USS Oklahoma City CL-91 earned the Asia Pacific Campaign Medal with two engagement stars for combat action in World War II. Most Cleveland class cruisers were scrapped, but that was not to be the Okie Boat's fate. World War II had demonstrated that the greatest threat to surface ships was aircraft. The Navy needed ships armed with guided missiles to provide anti aircraft protection for the fleet. New ships and missile systems were on the drawing boards, but were years away. As an interim measure several heavy and light cruisers were modified to carry the first generation missile systems that were developed after the war. On 7 March, 1957, the Oklahoma City was towed to the Bethlehem Steel Corporation's Pacific Coast Yard in San Francisco. Conversion into a flagship and Talos guided missile cruiser began on 21 May, and the ship was redesignated CLG-5 on 23 May. The conversion was a major reconstruction of the ship. Nearly everything above the main deck was removed or modified. Most of the 6"/47 and 5"/38 guns and all of the 40mm and 20mm antiaircraft guns were removed. All of the after superstructure and almost all of the forward superstructure was removed. The No. 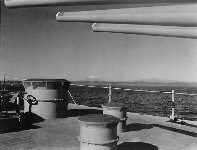 1 6"/47 triple turret remained, and 5"/38 mount No. 51 was relocated on the O1 level at approximately the position of the original No. 2 turret. Below the main deck forward new 5" ammunition handling equipment was installed. The forward superstructure was enlarged significantly to provide space for flag officer quarters, staff quarters and offices. The airplane catapults and hanger were removed from the stern. The hanger space was converted into crew quarters and storage space. A new armored deckhouse was constructed on the main deck for the Mk 7 Talos missile handling system and missile magazines. The Mk 7 Mod 0 missile launcher was located at approximately the position of the original No. 4 turret. A new deckhouse was constructed on top of the missile house to accommodate Weapons Control and the Talos tracking radars. Below the main deck aft were the Talos warhead magazine and warhead handling systems. New boat handling and stowage facilities were installed amidships. Three huge radar towers were added forward, midships and aft to carry dozens of radar, radio and electronic countermeasures antennas. With all these changes the ship bore little resemblance to the original Cleveland class ships. It was essentially a new ship. The conversion was completed on 31 August, 1960. The ship was towed to Hunter's Point naval yard where it was recommissioned on 7 September, 1960. The Oklahoma City CLG-5 and its new crew began shakedown training in January, 1961, and became the first guided missile cruiser in the Pacific Fleet to conduct a successful Talos missile launch. After shakedown and training exercises throughout the first half of 1961 the ship participated in training exercises and served as flagship for Cruiser Division 3 (CruDiv 3) and Cruiser Destroyer Flotilla 9 (CruDesFlot 9). On 1 December, 1961, the ship sailed for the western Pacific command (WESTPAC) for a six month deployment. Okie Boat arrived at the U.S. Naval Base in Yokosuka, Japan, on 20 December. "Yoko" had been the home of the Imperial Japanese Navy in World War II, and it had extensive ship repair facilities and one of the largest dry docks in existence. The ship relieved the USS Saint Paul CA-73 as flagship for the Commander, U.S. Seventh Fleet, on 26 December, 1961. After participating in SEATO training operations and "showing the flag" in many cities in the Far East the Oklahoma City was relieved as flagship of the 7th Fleet by USS Providence CLG-6 on 26 May 1962. The ship returned to Long Beach, California, on 12 June, 1962. The next few months were spent in inspections, training operations and upkeep. The ship again served as flagship for Cruiser Destroyer Flotilla 9 (CruDesFlot 9). In March 1964 the ship left the yards and began refresher training off southern California. Then the ship sailed again for WESTPAC on 16 June, 1964, serving as temporary flagship for the Commander in Chief of the Pacific Fleet during change of command ceremonies at Pearl Harbor. Oklahoma City arrived in Yokosuka, Japan, on 7 July, 1964, and relieved the USS Providence CLG-6 as flagship of the 7th Fleet. On 6 August, 1964, the ship was deployed to the Gulf of Tonkin with Task Force 77 in response to the Gulf of Tonkin incident. This was the beginning of eight years service in the Vietnam War. The ship alternated between gunfire support missions for U.S. and South Vietnamese troops, anti aircraft suppression missions off North Vietnam (NVN), shipyard visits in Subic Bay, Philippines, and Yokosuka, and "flag waving" ambassadorial missions to numerous ports in Asia. Oklahoma City provided gunfire support for the amphibious assaults in operations "Piranha," "Double Eagle" and "Deckhouse IV." After two and one-half years service as Seventh Fleet Flagship the Okie Boat was relieved by USS Providence CLG-6 on 1 December, 1966. The ship returned to San Francisco Naval Shipyard for overhaul on 15 December. During this yard period extensive additions were made to the ship's electronics countermeasures (ECM) systems to improve the defenses against anti-ship cruise missiles. Unnecessary topside weight was removed, including platforms on the after superstructure. The ship left the yards on 18 July, 1967, and began refresher training. The ship steamed to its new home port in San Diego on 22 July and assumed duties as flagship for the First Fleet. After calls to several west coast ports and an extensive training program the ship began preparing for another WESTPAC deployment. During this period several surface to surface test firings were conducted as part of the development of the new RIM-8H Talos anti-radar missile. In 1969 and 1970 the ship conducted missions in the Combat Zone in Vietnam, made port visits throughout Asia and did upkeep and repairs in Subic Bay, Philippines and Yokosuka, Japan. Approximately one third of the ship's time was spent off the coast of Vietnam, divided about equally between gunfire support missions in the south near DaNang and the Demilitarized Zone (DMZ) and anti-aircraft suppression off North Vietnam. From a station off Vinh, North Vietnam, the ship's long range air search radars could cover most of North Vietnam and Laos. The ship also cruised outside the harbor at Haiphong, hoping to get a shot at NVN MiGs. Earlier experience had taught the NVN that flying was not safe while a Talos cruiser was in the vicinity, so while the Okie Boat was in North Vietnamese waters the ship did not have the opportunity to fire Talos missiles at "live" aircraft targets. In 1971 the ship conducted Naval Gunfire Support missions in South Vietnam and operated on PIRAZ (Positive Identification Radar Advisory Zone) and SAR stations off North Vietnam. Between periods in the Combat Zone the ship visited ports in Asia and underwent upkeep and repair In Yokosuka. Oklahoma City took aboard the new RIM-8H Talos anti-radiation missiles in mid 1971. These missiles were designed to destroy enemy radar sites. After a practice firing off Okinawa the Oklahoma City spent part of its time off North Vietnam "radar hunting." 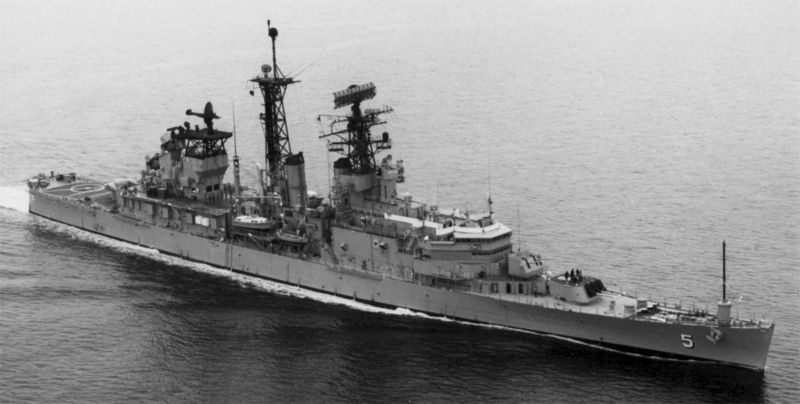 In February, 1972, the Oklahoma City became the first U.S. warship to conduct a successful combat surface-to-surface missile shot, destroying a NVN mobile radar system. The US stepped up activities against North Vietnam after NVN divisions invaded across the DMZ. The Okie Boat left Yokusuka and arrived in the Gulf of Tonkin on 7 April, 1972. The ship was assigned to Task Unit 70.8.9. On 8 April the ship received hostile fire from NVN shore batteries and returned fire. Oklahoma City, in company with several destroyers, moved north along the coast and fired on a series of targets in North Vietnam including installations at Cap Lay, Vinh, and the Dong Hoi Airfield. The ship was reassigned to Task Unit 77.1.1 on 13 April. On 14 April the ship again engaged NVN shore batteries. On 19 April Oklahoma City and accompanying destroyers conducted a second strike at Dong Hoi surface-to air missile sites. During this strike intense hostile fire was received from coastal gun batteries. The Oklahoma City received minor damage from from near misses - shrapnel chipped paint and cut a wire antenna. Shortly thereafter the Task Unit was attacked by two MiG 17 aircraft, one of which was reportedly shot down by a missile from the USS Sterrett DLG-313 (some sources claim the aircraft was shot down, and others say it wasn't). During the attack a bomb exploded off the OK City's starboard bow but caused no damage. The destroyer USS Higbee DD-806 was hit by a bomb aft and though several personnel were injured, there were no fatalities. Several NVN torpedo boats also attacked the Task Unit, and at least one was destroyed. This engagement has become known as the Battle of Dong Hoi. The Okie Boat and accompanying ships continued engagements with NVN coastal guns for several weeks, destroying gun installations, radar sites, missile sites, airfields, bridges, fuel storage sites, communications facilities and troop barracks. On 10 May, 1972, Oklahoma City joined the cruisers USS Newport News (CG-148), USS Providence (CLG-6) and destroyers USS Hanson (DD-832), USS Myles C. Fox (DD-829) and USS Buchannan (DDG-14), and shelled the Cat Bai military airfield on the Do Son peninsula at the mouth of Haiphong Harbor, North Vietnam. This was the first multi-cruiser strike since World War II, and was a repeat of the multi-cruiser bombardment the ship participated in 27 years earlier during WWII. The ship continued to conduct Naval Gunfire Support operations through the rest of 1972, along with protocol visits to ports in Asia and upkeep in Subic Bay and Yokosuka. The OK City fired about 18,080 5"/38 and 31,370 6"/47 rounds in more than 1,100 Naval Gunfire Support and shore bombardment operations during the Vietnam War, or a total of 49,450 rounds. The total weight of the projectiles was approximately 4,211,430 pounds, or 2,105.7 tons. The USS Oklahoma City earned the Armed Forces Expeditionary Service Medal with two campaign stars and the Vietnam Service Medal with eleven campaign stars for service during the Vietnam War. The formal cease fire for the Vietnam War was announced on 28 January, 1973. After this the pace of activities slowed dramatically, but the Oklahoma City continued to visit the Gulf of Tonkin through May to help enforce the cease fire. The ship continued its schedule of good will visits throughout WESTPAC, with frequent training exercises and inspections to keep the ship in a state of readiness. In 1974 the ship had a series of shipyard periods for a Navy Distillate fuel conversion modification to the engineering plant. The Oklahoma City participated in the final actions of the Vietnam War. In April 1975 the ship took part in operation Frequent Wind to rescue American and friendly Vietnamese personnel during the fall of Saigon. From 22 April to 30 April The Okie Boat served as command ship for the operation. On the 29th and 30th the ship landed 13 helicopters carrying 154 refugees fleeing the North Vietnamese Army as it captured Saigon. The Oklahoma City was redesignated CG-5 on 30 June, 1975. It underwent an extensive series of Regular Overhaul periods to renovate much of the ship in 1975. OK City continued to serve as Seventh Fleet flagship, showing the flag and serving as ambassador in ports in Asia and the South Pacific. Cruises took the ship to Guam, around Australia, to Indonesia, and to ports along the east coast of Asia from Malaysia and Singapore to Korea and throughout the Japanese Islands. From 1975 through 1979 the ship continued to conduct training exercises and inspections to maintain a state of readiness. She conducted several multinational training operations with ships from the navies of Australia, New Zealand, Indonesia and Japan. In May, 1979, The Oklahoma City fired the Navy's last Talos surface to air intercept exercise off Poro Point, Republic of the Philippines. The ship began a series of BUZZARDEX operations firing Talos missiles as targets for aircraft and other ships with advanced Terrier and Standard missile systems. The inspection schedule became more rigorous as the Navy evaluated the old girl's aging condition. The ship continued to get a passing grade on INSURV inspections after other ships of its generation were found unfit for service, a tribute to the efforts of the crews to keep the ship operational. In 1979 the Navy finally decided to retire the ship. On 5 October, 1979, the Okie Boat was relieved as Seventh Fleet flagship by the command ship USS Blue Ridge (AGC-19) at Yokosuka, Japan. On 9 October, 1979, the USS Oklahoma City sailed from Yokosuka, Japan, for the last time. After serving eleven continuous years in WESTPAC as flagship of the Seventh Fleet the ship sailed to Pearl Harbor, Hawaii, and then to San Francisco, California. On the way from San Francisco to San Diego the Okie Boat participated in another BUZZARDEX off Point Magu. In this exercise the USS Norton Sound (AVM-1) achieved the first successful intercept of a Mach 2.7 Talos target with a Standard 1 missile and the prototype Aegis fire control system. On 6 November, 1979, the Oklahoma City launched the last Talos missile fired from a ship and fired the last 6"/47 gun salvo from a US Navy ship. The USS Oklahoma City was decommissioned and stricken from service on 15 December, 1979, in San Diego, thirty five years after beginning service in the U.S. Navy. The Oklahoma City was on active duty for twenty one years, the longest service record of all ships of the Cleveland class. The ship was awarded ten medals and three commendations, and earned fifteen engagement stars for action in World War II and Vietnam. In December, 1979, the ship was towed to Puget Sound Naval Shipyard in Bremerton, Washington, and placed in the mothball fleet. It remained there until 1992 when it was towed to the Suisun Bay Reserve Fleet at Benicia, California. After hull repairs at Richmond, California, the ship was modified to serve as a test platform for new weapons sensors and countermeasures systems. The ship was then towed to Port Hueneme, California, where she was occasionally towed out to sea to test new electronics and radars, including equipment for the B2 bomber. In the spring of 1996 the ship was transferred to inactive ships and the decision was made to use her as a target in a SINKEX (sink exercise). She was towed to the Suisen Bay Reserve Fleet to await her fate. In October 1998 the ship was towed to Mare Island Naval Shipyard, Vallejo, California, for preparation as a target ship. The ship was towed through the Golden Gate on 6 January, 1999, arriving in Pearl Harbor, Hawaii on 20 January, 1999. 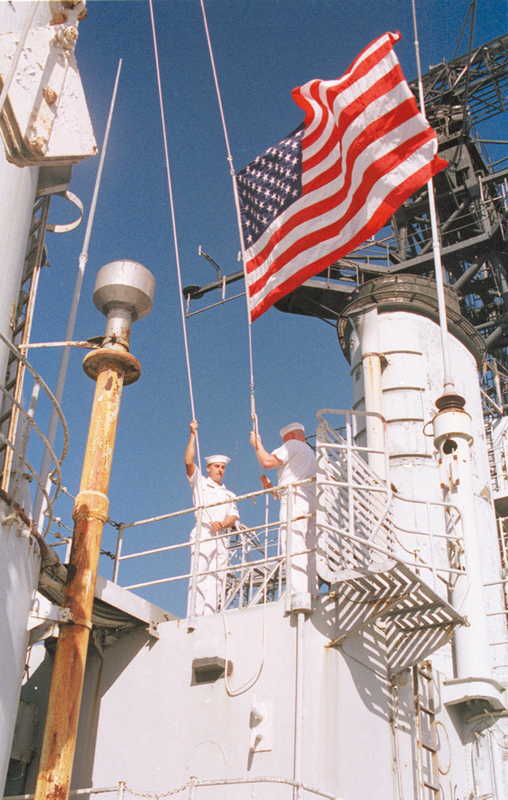 While at Pearl Harbor the Stars and Stripes was hoisted to the top of her mast for the last time. On 16 February she was towed to Guam by the USS Narragansett (ATF-167). As part of the Multinational Training Exercise 1999 the ex-USS Oklahoma City was fired upon by ships and aircraft from 25 to 27 March, and finally was sunk by a torpedo from the South Korean submarine Le Chung (SS-062). The ship sank about 230 miles (375 km) southwest of Guam (10° 57' 00" N, 142° 06' 00" E) in about 6000 feet of water on 27 March, 1999, at 11:03 AM, 25 minutes after being torpedoed. * Thanks to Bob King, USMC, CL-91 plank holder, for sharing photos of the OK City during WWII. ** Thanks to ADR2 Ed Cassady for correcting a gross error about the April 1969 EC-121 incident. It was a Navy plane! *** Thanks to Dave Nilsen for correcting me about the AN/SPS-8B radar.